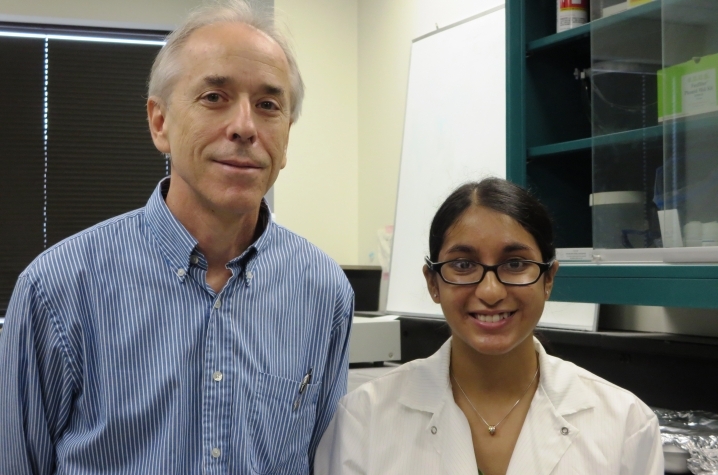 LEXINGTON, Ky. (Sept. 30, 2013) — Manasi Malik has just begun her junior year at the University of Kentucky, but the 19-year-old biology major has already been published as a lead author on a paper in a prestigious scientific journal. A native of Massachusetts, Malik came to UK with the intention to become involved in research, and has found success working in the lab of Alzheimer's disease researcher Steve Estus of the UK Sanders-Brown Center on Aging. Malik's paper, written in conjunction with Estus and other researchers, is titled "CD33 Alzheimer's Risk-Altering Polymorphism, CD33 Expression, and Exon 2 Splicing," and appeared in the Aug. 14 issue of the Journal of Neuroscience. The paper points to a potential genetic target in understanding and reducing Alzheimer's risk. Within the Estus lab, she explained, each researcher is assigned to work on a particular gene. Although Malik works primarily on the gene known as CD33 and its involvement with Alzheimer's disease, she credits the team approach of the lab for the success of all the involved researchers. "A lot of people have put a lot of collaboration into this project," said Malik. After working in a laboratory in Massachusetts during high school, Malik chose to come to the University of Kentucky both because her sister was enrolled in the UK College of Medicine, and because she knew the campus offered opportunities for undergraduates to become involved in high-level research. Beginning work in the Estus lab during the Fall semester of her first year at UK, Malik has narrowed her interests to the area of molecular biology, and is enrolled in the B.S./M.D. program, designed to put her on track to attend medical school after earning her undergraduate degree. "I really loved the UK environment," said Malik, who is a member of the UK Honors Program and a Singletary Scholar. So why did she want to get involved in undergraduate research? "I like lab work a lot," said Malik. "I think it's fun. I like the puzzle, the troubleshooting. I feel like I know what steps to take in research now. A big question, broken down into small experiments, yields answers." "It's very elegant," she said of her studies on the molecular level. 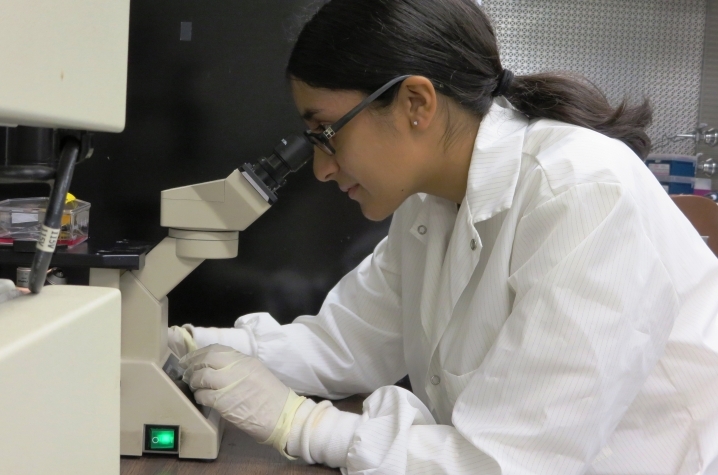 "Freshman year I was so intimidated," said Malik, of beginning her work in the Estus lab. "I now really feel like part of the lab, and I like all of the people. Even if Dr. Estus is busy, he'll spend hours answering your questions." Besides her research involvement, Malik spent several months in 2013 studying marine biodiversity and conservation with the Sea Education Association program in the Sargasso Sea. Conducting oceanographic research while serving as part of an active sailing crew, she learned the ropes of both biological field research and manning a sailing vessel. In addition to academic work, Malik has spent several semesters volunteering for UK HealthCare. She has served in areas ranging from the Markey Cancer Center, to the cytogenetics laboratory, to the UK Pediatrics Twilight Clinic. She notes that her experience in the UK HealthCare environment has been critical to her decision to pursue medical education after earning her undergraduate degree. Malik's experience is representative of a number of UK undergraduate researchers, as she has earned class credit for her research through the BIO 395 course option, as well as Honors independent projects. Funding from the "Bucks for Brains" program has enabled her to continue her research over the summers. Ultimately, Malik would like to earn both a medical degree and a doctorate in molecular biology, to enable her to build a career incorporating both lab bench and bedside work. "I'm open to anything," she said. 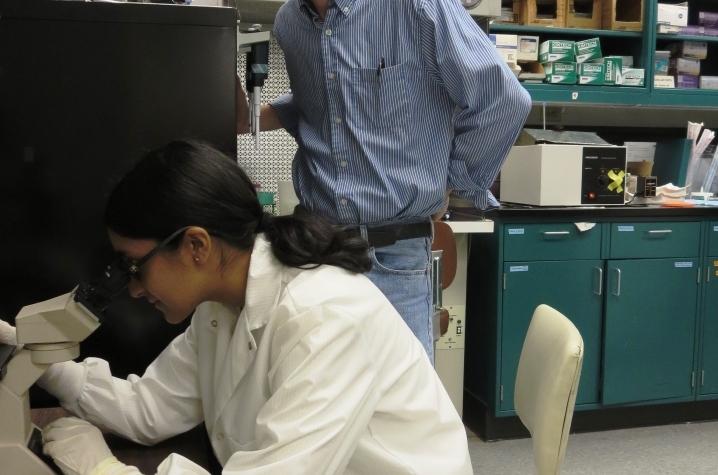 "My research experience has been a really, really good opportunity as an undergraduate."